This page is being prepared and tested for use in the field. The notes that follow are for the most part the herbs discussed in Amy Bess Miller’s Shaker Herbs. They are arranged in groups based on overall appearances, not necessarily their taxonomy. The order in which they are presented is based on the groupings, staring with native to naturalized to domestic to foreign. Each of these groups is then listed alphabetically based on the Genera (single=Genus) names. An alphabetical listing of Genera regardless of taxonomic relationships appears at the end of this page. PART 1. By major botanical groups. COMMON NAME–the common name for the plant used to refer to it in the book. Some herbs have duplicate entries for the Latin name due to manner in which this information was presented in the book. LATIN NAME–as it states, with most Latin names provided as they appeared in the text; a few Latin name identification had to be clarified. COMMON NAMES–these are the other common names recorded by the Amy Bess Miller. These names were presumably used by the Shakers she met with and interviewed for this work. Some of the common names appear misapplied, and seem better suited for another plant. These names were presumably noted to Miller by the individuals she reviewed or interviewed. They could be in error, or used to refer to a very similar plant with a different background regarding uses. Only Latin Name and Common Name are provided. Only the major column with a common name is applied to this listing. Alternative common names are not included in this list. The columns are self explanatory. Note: The most important reference for Common plant names ever published in A. B. Lyons Plant Names Scientific and Popular . . . . ca. 1907 (several editions), printed by Nelson, Baker & Co., Detroit. This book is on Google Books. Over the years, this book has answered many questions about plant identities, including a number of secondary historians who misidentified the plants in their recent writings. This book provides its reader most to all plant names ever documented prior to the year it was published. These are provided in alphabetical order in the book, by Genus and species. Althouh the Latin names are old, the taxonomic names and their citations for the source of the Latin name are invaluable for tracing the history of 19th century medicinal plants. Very local or personal plants names are of course not expected to be included in this book, so some of the personal, slang or highly local names for these plants provided by Shakers are not expected to be found in this book. Lyons’ book remains the best reference out there, in spite of numerous attempts made by publishers in recent decades to produce a very useful botanical name dictionary. Adriaen VanderDonck, whom Yonkers was named after, wrote a natural history description about the land he was provided for settlement. The purpose of this book was to promote the colonization of this part of the New World. It contains a description of several dozen herbal medicines, and represents one of the first such listings of medicinal plants related to New York Hudson Valley history. A number of VanderDonck’s plants are named for their European similars or look-alikes. Others are provided very local names, a few of which are not found in Lyon’s reference noted above in the Preface. Cadwallader Colden produced New York’s first lengthy botanical. This book was written in two parts between 1733 and 1737. It was then forwarded to botanists from Sweden and England (Peter Collinson) for review; they ultimately forwarded it to Carl von Linne. A few years later, a Swedish society of scientists overseeing the work of Linne and other scholars approved Colden’s work for publication. It was then printed and distributed as a part of their annals for 1749 and 1751. Cadwallader Colden’s daughter, Jane, is the first female botanist. Her skills often appear to be more like those of a botanical artist or illustrator. However, she was favored strongly by Linne, who referred to her as a botanist. No evidence exists however demonstrating the skills of Latin required for her to receive this recognition officially. Jane’s work surpassed that of her father in regard to her review of additional species not reviewed by Cadwallader. She also documented some of the local ethnobotany, referring to the local culture as a unique breed of people whom she referred to as Hudsonians, or “Hudson’ns”. John Bartram is one of a number of botanists from the Philadelphia area that Colden and other New York botanists would inevitably come to know. As a natural he was learned in botanical medicine and contributed to the first documented knowledge about American herbal medicine plants. Other Philadelphia botanists of importance to local history include John’s son William (middle portrait in the above image) and their successor Benjamin Smith Barton (right). Dr. Manessah Cutler produced the first American Indian ethnobotany essay for Massachusetts as his Thesis for Harvard. This book would later develop a very strong following of religious leaders interested in and supportive of local herbal medicine use. Other metaphysicians who became doctors in New York and the Hudson valley were usually well-read in the writings of Cutler. TWINLEAF Jeffersonia diphyllum Ground squirrel pea, rheumatism root, helmet pod. Early Botanists John Bard, New York, and his son Samuel, and Linnaeus-trained Adam Kuhn of Germantown, PA. John Bard wrote an early essay on indigenous remedies. Samuel Bard taught in New York and upon retirement moved the Hyde Park (now the Bard College campus) where he established a garden devoted to this subject. David Hosack was a British trained scientist who commenced his work as a professor at the Columbia College in New York City. His work in New York included managing the medicine garden. Upon retirement he bought the Bard’s property in Hyde Park and maintained the garden. American herbalism had yet to become very popular when he commenced his teaching career, but in just a few years, American botany was one of the most important fields of study. It was up to botanists like Hosack to continue documenting the local knowledge of herbal medicine. It is now about 75 years since Cadwallader Colden first wrote his flora of the region, published around 1750 by Linne. Many of Hosack’s writings suggest lack of familiarity with the non-nativity history of some of the plants he reviewed. In part this may have been due to the reduced interest physicians were expressing for herbs, in exchange for spending more time on the much stronger mineral remedies and certain poisons removed from traditional plant medicines. By the turn of the 19th century, this focus on chemistry led to the extraction of the first alkaloid, “morphium” (later called morphine), from Papaver somniferum by German Chemist Friedrich Sertürner in 1804. Samuel Thomson probably developed his interest in American herbal medicine as a child prior to 1806 or 1807. Since the late 1790s, the notion of poisons or toxins was one of the points of focus physicians were taking when trying to assess their medical value and the various causes for their clinical activities. The alkaloids were discovered during this time, Papaver latex was further concentrated resulting in production of some of the first fairly pure opium products. Salts and mineral were being assigned medicinal values. Certain substances like arsenic, lead and mercury salts were assumed to be stronger medicines due to their stronger, more potent, toxic effects upon the human body. Many lay people were against the increasing popularity of these mineral remedies, and so, like Samuel Thomson, began searching for the simpler alternatives to the mineral remedies like opium and mercurials, and a much safer way to be treated for illness without the use of the lancet. 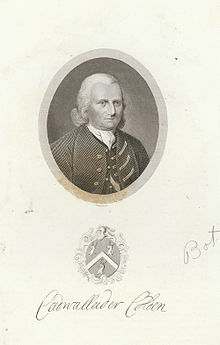 William Currie, a regular physician from England, did much to promote the bath as one possible means for achieving a cure . The American herbal medicine movement led to recommendations that American products be used as substitutes for imported medicines–in Thomson’s case, Lobelia was used instead of the imported Ipecac since it was found to ne an effective emetic on his friends (knowledge learned by performing a practical joke). 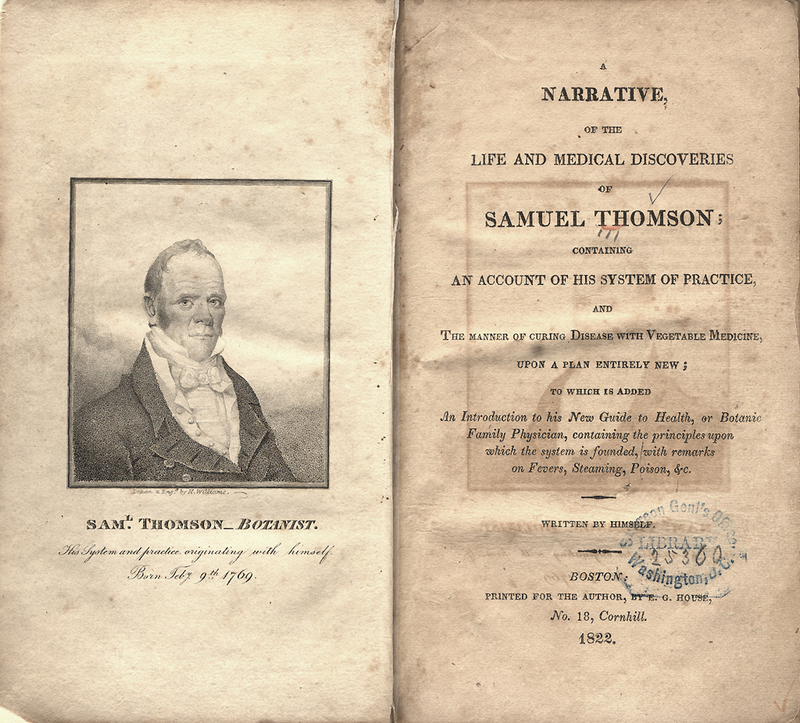 Thomson’s protocols were fairly simple, and his book, although written primitively, had a ring to its content and structure that resulted in the rapid rise in popularity of Thomsonianism after 1820/1825. Between 1815 and 1820/1822, Thomsonianism was mostly a practice preached by way of pamphlets and small books. Once it became regionally popular in the valley and western NewYork, entire books replaced Thomson’s original works, some authored specifically by the local physician (see Elias Smith, for example, western NY), with ca. 1825-1832 publications on Thomsonianism). In the case of the Hudson valley, Thomas Lapham of Poughkeepsie was the primary promoter of Thomsonianism, first promoting these medicines out of his home and in his shop. He later became the primary publisher of Thomsonianism books and trade magazines from about 1844 to 1850. Shaker herbal medicine manufactories were the primary producers of these medicines. Wooster Beach graduated from a New York City medical school in 1824. In 1825, he was promoting his concept of “Reformed Medicine,” claiming that regular medicine was in need of significant change. He opened a school in New York City, but was soon after run out of the city by a mob. He migrated westward toward Ohio, where he was finally accepted by a medical school in Columbus, Ohio around 1834. Between 1820 and 1834, he like others promoted Thomsonianism, and attended their regional and national Friends’ meetings. But Beach’s Reformed Medicine was also into certain allopathic principles as well, and so soon came to be called “Eclectic Medicine” according to the recollections of a fellow student, historian and practitioner of this field), due to comments about “the eclectic nature” of how its practitioners selected their remedies. This field allowed for most kinds of treatment then popular with the exception of blood-letting and the use of mineral remedies (although some exceptions exist), and due to some ongoing politics then developing, the practice of homeopathy. This form of non-allopathic medicine had a very strong following between upstate New York and Ohio. Its assocaition with the Shaker’s herbal medicine market however is uncertain during the early years (pre-1835). Between 1837 and 1842, Dr. John King of the Eclectic accidentally produced a highly concentrated extract of a plant that he was boiling. Finding it to still be effective, he promoted the use of these “concentrated extract” and tried to patent his formulas. This method of manufacturing herbal medicines was subsequently taken up by a number of companies, at least one of which was a regular medicine company. From about 1845 to 1850/1853, the Eclectics were most strongly assocaited with this drug production technique. By the mid-1850s, the Shakers ultimately had their own producers engaged in this, which ultimately led to the formation of companies that specializing in these products using their herbs. Pehr Kalm from Finland-Sweden toured the mid-Atlantic colonies up to Niagara Fall, 1749-1750. Constantine Rafinesque was a French Botanist from France who produced on the first extensive multivolume review of the local flora, although in French rather than English. Thomas Nuttall is one of several naturalists who toured this part of the United States and documented the local herbal medicines as well as the local zoology, often focusing on ornithology. Your history is a very impressive body of work.